EMPEDOKLÊS. 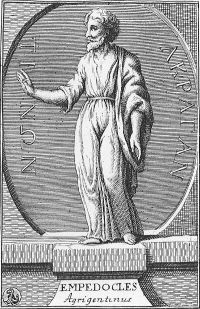 Circa 450, B C.
THE most remarkable of the poet-philosophers of Antiquity—the highly eulogised of the greatest of Latin poets—Empedoklês, of Agrigentum (the modern Girgenti) in Sicily, may fitly be regarded as Pythagorean in his ethical principles; although commonly classed as of the (so-called) Eleatic School, It is possible that he may have heard the celebrated instructor of Euripides and of Periklês, Anaxagoras, with whom his physics seem to have been partly in agreement. It is unnecessary to discuss, in detail, his abstruse physical theories, which, like those of the old Hellenic savants, in general, can have little interest for the ordinary reader. It will be enough to state the distinguishing feature of his philosophy—a sort of Zoroastrianism in physics—to have consisted in the theory that the principles of Benevolence and Malevolence are in constant antagonism in the physical universe—that Benevolence or Love is the motive power which alone tends to hold together the discordant cosmic elements. As for the human animal himself, "the Agrigentine" taught Love, conjoined with pure Intellect, to be the only true means of his attaining the knowledge. He was idealist in rejecting with Plato, and the School of Berkeley, and Kant in modern times, the reality of the impressions of the senses. Of the four elements, with Herakleitus, "the weeping philosopher, he taught Fire to be the chief of the primordia rerum, and the central soul of the universe. So great was his fame for the higher Gnosis and, in particular, for medical science, that even during his lifetime he was regarded as semi-divine, and he himself was commonly asserted to have aspired to divine honours. In fact, it must be owned that in spite of, or perhaps, by reason of his marvellous attainments, he seems, with other transcendental intellects, not to have been able wholly to resist that "last infirmity of noble minds," the temptation of Fame. But there can scarcely be a doubt that much of the extravagant assumptions, as well as opinions, attributed to him by gossiping writers hostile to Pythagoreanism, is pure fable; otherwise it is improbable that Lucretius would have made him the subject of special eulogy in his rationalistic poem (1). Only fragments of his philosophical poems On Nature, the Discourse on Medicine (some 470 verses), and the Lustral Precepts remain (2). It is thus that he sings of the "Golden Age":—"Then every animal was tame, and familiar with men—both mammals and birds; and mutual love prevailed The trees flourished with perpetual leaves and fruits, and ample crops adorned their boughs throughout the year Nor had these happy people any War-God, nor had they any mad violence for their divinity. Nor was their monarch Zeus or Kronos or Poseidon, but Queen Kypris [the divinity of Love]. Her favour they besought with fragrant essences, and censers of pure myrrh, and frankincense, and with golden honey. The altars did not reek with the blood of oxen." In the eloquent verses in which, after having sung the praises of Sicily as "for many reasons the object of admiration of the world," he proceeds to glorify "the Acragantine," as "its most illustrious, saint-like, a marvellous, and precious offspring," so that "he seems to be scarcely of human birth " De Rerum Naturâ, I, 715-735. In this last [Greek omitted] the poet insists (as far as can be collected from the fragment) on moral conduct as the only true and efficacious method of averting disease and other evils. Cp., the remarkable, similar, expressions of the elder Plinius Quisquis est Deus, si modo est alias, quâcunque in parte, totus est sensus, totus visus, totus auditus, totus animus, His. Nat. I. I. See Studies of the Greek Poets, by T. A. Symonds, 1873, from which the above fragments are quoted. One of the most considerable of the poems of Matthew Arnold has Empedoklês on Etna as its subject. Dictionary of Greek and Roman Biography, Ed. by Dr. W. Smith, 1859. Studies of the Greek Poets by J. A. Symonds, 1873. The Fragments, with commentary, edited by F. W. Sturz, were published at Leipzig, 1805. The Fragments of Empedocles (PDF 5mb) trans. W.E. Leonard Ph.D., Chicago, 1908. Part 2 refers to transmigration of souls and the Orphic/Pythagorean traditions. The Lives and Opinions of Eminent Philosophers (PDF 15mb) by Diogenes Laertius (?412-?323 BC), trans. C. D. Yonge B.A., London, 1853. Includes sections on Pythagoras, Empedocles, etc.